No need to elbow your partner to shut them up. Does your significant other snore while they sleep, soundtracking your night with the sound of rocks falling down a mountain? Are you flirting with the idea of getting the lawyers in? Because Finnish company QuietOn is hoping to restore harmony in the bedroom with its latest invention, the QuietOn Sleep. QuietOn made its name with a set of noise-cancelling earplugs, designed to drown out the sound you endure whilst on a plane. The gear does more than just block up your ear canal, too, since they pack active noise cancellation to really make things quiet. Consequently, they've also found a home in workplaces, noisy construction sites and anywhere else someone wants to concentrate. The Sleep edition of the earplugs uses the same principle, albeit engineered to keep things quiet while you're dozing. The hardware is significantly smaller in order to make it easier to wear for prolonged periods in bed. 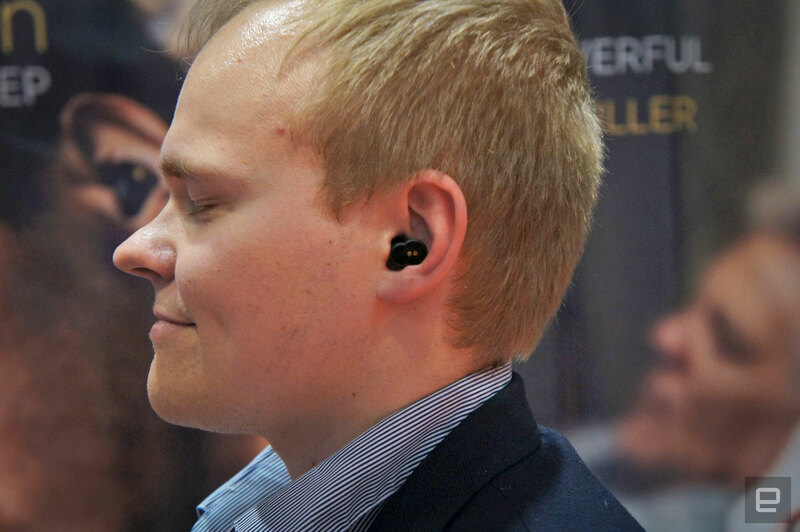 In addition, the set comes with pass-through mode, disabling the noise cancellation with a tap of the bud — letting you listen to your other half when they want a midnight chat. One other change is that the final hardware will ship with a special cushioned sleeve that can wrap around the hardware component. That way, if you sleep on your side, you won't have to worry about a hard lump of plastic making its presence felt inside your tragus. Much like the original version of the set, the QuietOn Sleep will ship with an AirPod-esque charging case that you can slide them into when not in use. That won't be every night, however, since the units will run for close to 20 hours on a single charge. The company is raising funds through a pre-order campaign on Indiegogo, with early birds able to snag the gear for $109. If you'd prefer to get the technology in your nearest store, however, you can expect to pay $239 or so. But no matter how much cash you pony up, you won't be able to look forward to silent, snore-free nights until October at the very earliest.